NRK in Norway selects LiveU technology for reindeer coverage. Hackensack, NJ, August, 2017: Norway’s public broadcaster NRK selected LiveU and Radionor to provide groundbreaking Slow TV coverage of the annual reindeer migration across the Norwegian wilderness. 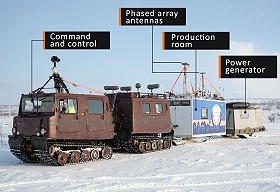 The combined technologies allowed the broadcaster to create over 150 continuous hours of live programming across broadcast – NRK 2 – and online streaming through the north Norwegian wilderness that meant new technologies and new ways of thinking were required. The LiveU technology was supplied by Mediability.